I really love Tofu as you have probably noticed! I am a big fan of Tofu’s clean taste and ability to absorb so many different flavors. I am always looking for different ways to prepare Grilled Tofu. I am a big fan of Balsamic Vinegar! I love everything about it, it’s a staple in my house. I always dress my salads with a simple Balsamic and Extra Virgin Olive Oil dressing. Salad dressing is not the only thing you can do with Balsamic Vinegar. It works really well for Tofu! I use Balsamic Vinegar as a base for the tofu marinade which is then turned into a delicious glaze! This Tofu is really tasty. I have been playing around with the recipe for a few months and I think I finally got it right! This Balsamic Glazed Tofu has a slightly tangy taste with a touch of sweetness. It can be made grilled or baked, I tried both ways and both turn out really tasty! Like I said earlier the tofu marinade does not go to waste because it is reduced into a scrumptious glaze! Grilled Version serves about 2-3 people, Baked Version serves about 3-4 people. 1/2 – 1 Tablespoon Agave nectar (This depends on how sweet you like it, if you like it more sweeter use ! tablespoon or more. You can Cut the Tofu anyway you like, I like to cut it into triangles or slabs. Cut the Tofu in half diagonally. Now take the two tofu triangles and cut them into three triangles each. 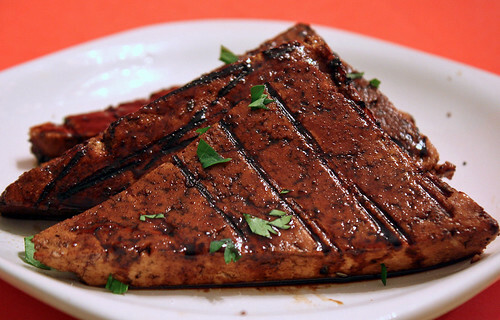 For the baked Tofu, cut it into 4 triangles each. You should get 6 triangles for the grilled tofu and 8 for the baked tofu. Cut the Tofu width-wise into 5-6 pieces for grilled tofu and 7-8 pieces for the baked tofu. After you have the cut the tofu, mix all the marinade ingredients in a mixing bowl. I like to marinade the tofu in an 8 by 8 baking pan. Pour the Marinade over the tofu. Marinade the tofu for at least an hour. Turn it halfway through. The longer you marinade it the better! When the Tofu has marinated take the tofu out and set it aside. Strain the marinade to remove the garlic. Preheat a small saucepan over medium heat. Add the Marinade mixture to the saucepan. Bring it to a boil. You want to keep it on a medium simmer. Cook the marinade for about 10 minutes until it starts to thicken and look like a glaze. Remember to keep stirring unless you have a non-stick saucepan. You want to keep an eye on it to prevent it from burning, it happened to me once so that’s why I bring it up. I actually burned a saucepan from doing this a while back! Preheat a Cast-iron grill pan to medium-high heat. When it is hot, place the tofu on the cast iron grill pan. Grill the Tofu about 2-3 minutes per side. If your tofu is cut into slabs, grill the tofu 1-2 minutes per side and then turn it 90 degrees to form cross-hatch grill marks. As the Tofu is grilling, brush it with the Balsamic Glaze. Place the tofu on a slightly greased baking sheet. Bake the tofu for about 20 minutes. Then flip it over and bake it for about 10 minutes. Brush it with the glaze towards the end because you don’t want the glaze to burn. If you like a chewier tofu place it under the broiler for 2-3 minutes, make sure to keep an eye for it! I love tofu too! Usually when I’m tired or in a hurry, I just slice it up, toss it in salt and nutritional yeast, and pan fry it until crisp. I’ll have to give your marinade a try! That looks delicious. I appreciate the same characteristics about tofu which is why I eat it a lot even though I am not a vegetarian. Balsamic vinegar is also one of my favorite ingredients so I imagine that dish must be heavenly. I’ve been meaning to adapt a favorite chicken dish to tofu. It’s called vanilla balsamic chicken and the glaze involves broth, balsamic vinegar, shallots, brown sugar, orange rind, orange juice, and vanilla bean. It’s pretty darn heavenly and I imagine it would be even more amazing with tofu since the chicken doesn’t add much to the recipe. Mmmm. You are reminding me that I will have to try this. Jay:This sounds really interesting. I’ll be looking forward to your recipe. I agree your tofu looks picture perfect. I made this and it was sooooo gooood!!! I had balsamic syrup and drizzled it over. The color on that tofu is fantastic! I have personally just discovered balsamic reduction, and think I’ll be using it a lot. hello,your recipes are so cool,I hope it taste the way it looks I am a chinese food amateur and like cooking the dish myself,I’ll try it,I hope I could cook this dish as yours,thanks for sharing again. Made this a few days ago and it came out great, marinated it overnight which imparted a lot of flavor. Used lots of fresh herbs! I’m making a variation on this right now. I’ve added Pomegranate Juice and a little Dijon Mustard. It’s marinating now, but I’m sure it’ll turn out delicious. I made it yesterday for the fist time and loved it. My guests were very impressed and there were no leftovers :0(. Thank you!!! Oh wow. I think I may have made it incorrectly, but it was tough to eat. It tasted like straight up vinegar. « Pasta, Burek, Eggplant and Harvest Grains, and Madison!